We Swam to This Waterfall! This is a picture of a waterfall that we swam to. It was taken after our swim from a vantage point further up the trail! If you've had a chance to read about our day of hiking this trail with Hike Maui, you'll already know the story that goes along with this picture, so I won't repeat it here! All in all, it was a really cool experience that I will never forget, and I'm so glad we did it! If this is something you'd like to do, I recommend that you go with an experienced guide. An experienced guide will know how to minimize the risk of falling prey to a flash flood (although rare, there have been cases of swimmers being washed downstream over a waterfall and dying due to such floods.) Also, experienced guides will know which stream are clean and free of bacteria like Leptospirosis that can make you sick. The 400' high Waimoku Falls was definitely the crown jewel out of all the Maui waterfalls that we saw on this wonderful day! This 400' tropical waterfall spills down a magnificent sheer wall of rock before landing in a pool sprinkled with fallen boulders. A note of caution: As tempting as it may be, don't get too close to the base of the falls - hikers that get too close risk injury from falling rocks. 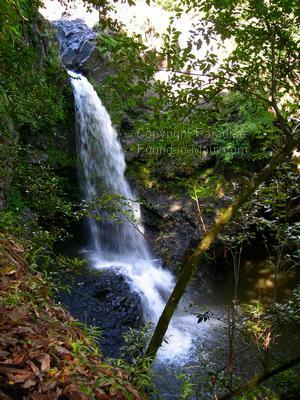 This waterfall is located at the end of the Pipiwai Trail, and makes a perfect spot to take a break from hiking and enjoy a picnic lunch. There are lots of boulders strewn about... not just up close to the base of the falls where it's unsafe, but further away too where it IS safe to sit and relax! I'm afraid I don't have a story to go along with this picture... but I thought it was another great example of the kinds of Maui waterfalls you can see along the Pipiwai Trail! This might have been taken from a bridge that crossed over the stream... hmmm... not sure about that though. What can I say... we saw a LOT of tropical waterfalls on this hike, so it's hard to remember all the details! Want to See These Waterfalls for Yourself? Many people on a tight budget find that exploring this trail without the expense of a guide is the way to go. For no more than the cost of gas to drive there, a picnic lunch, and park admission a person can hike this trail. But if you have room in your budget for this, would enjoy learning all about the area's wildlife, plants, and history from an experienced guide as we did, AND would like to enjoy the views on the way there while your guide takes care of the driving, then I highly recommend you consider going on this adventure with Hike Maui. 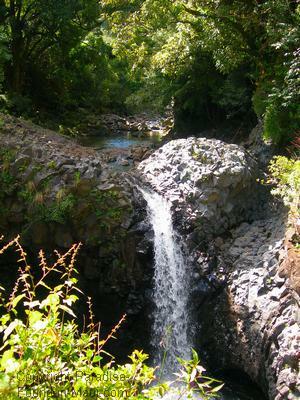 1) See pictures of Oheo Gulch tropical waterfalls. 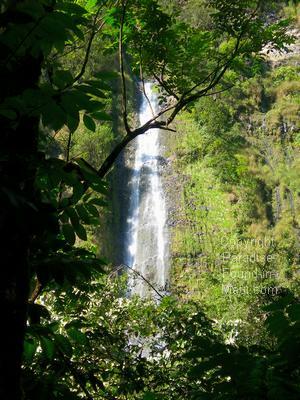 2) Read more about our Haleakala National Park Waterfall/Rainforest Hike Experience on the Pipiwai Trail! 3) Go to Maui Pictures: Some of my Favourites!